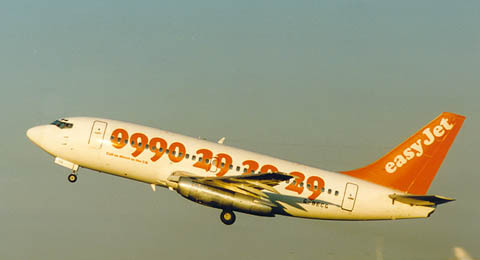 While easyJet was only founded in 1995, you would not think its liveries had changed all that much. Fortunately, for those who like to take pictures of aeroplanes, easyJet has gone though plenty of changes ! 737-204(A) G-BECG (cn21335/487) is seen here with one of easyJet's telephone numbers on the fuselage. Booking a ticket was mostly done over the phone, while later booking through the Internet became widely accepted. 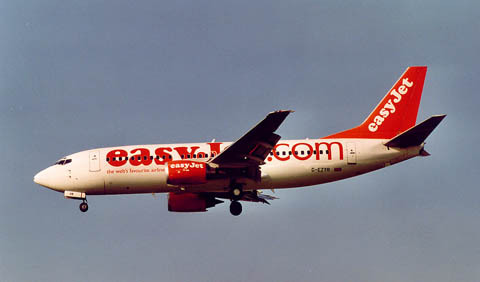 The success of easyJet, right from the start, made it possible for easyJet to change from the second-hand 737-200s to more modern versions of the Boeing 737, quite quickly. The photo was take at Schiphol, July 1996. G-EZYI is a 737-33V (cn29333/3084) and displays the other telephone number for booking a ticket with easyJet: 0870 6 000 000 (maybe easier to remember by heart !). G-EZYI is seen here on final approach to runway 19R at Amsterdam-Schiphol Int'l Airport in January 2000. We see here the same aircraft but devoid of any titles, also at Schiphol but in July 2000. British Airways looked down upon easyJet at first, but began to feel the pain of passengers booking with easyJet instead of BA. And so GO Fly came to being, the low-cost carrier by British Airways. EasyJet feared GO would offer tickets, subsidized by BA, with unrealistic prices and in this way aim for the bankruptcy of easyJet. 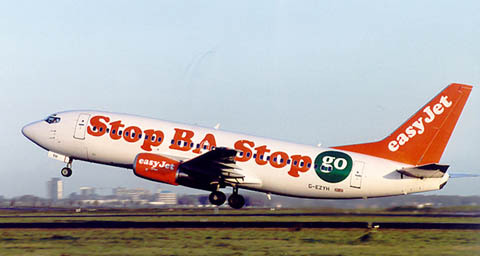 But BA found out that managing a low-cost carrier was quite a different thing and sold GO Fly. And easyJet went on with making money, lots of money. 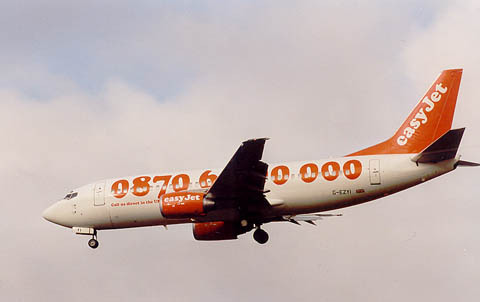 There is also an easyJet Switzerland, as depicted here by HB-III 737-33V (cn29338/3114), just after push-back at Amsterdam-Schiphol in July 2000. 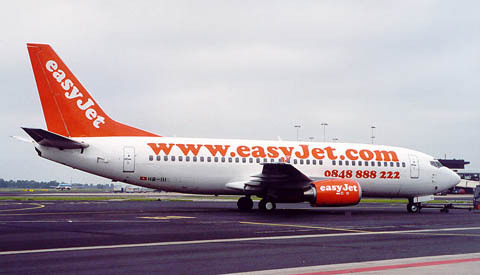 737-33V G-EZYR (cn29341/3125) is seen here with the present (2002) livery, showing the website's adress: www.easyjet.com. This shot was taken at Amsterdam too, Oct.12th 2001.